Experts who are analyzing the Hacking Team internal emails discovered that the firm is working on the development of a weaponized drone. Security experts are continuing to dig the leaked internal emails from the Hacking Team, last revelation is related to the development of an unmanned aerial vehicle with the ability to run cyber attacks on computers and mobile devices through Wi-Fi networks. Reading the email exchange between hacking team personnel, it is possible to verify that both Boeing and Hacking Team were working to a new model of Drone to use as attack vector. The unmanned aerial vehicle is described as a drone that have to be able to run cyber attacks on targets via WiFi, the vehicle has the ability to inject spyware into target systems in order to spy on victims. According to the internal emails, after attending the International Defense Exposition and Conference (IDEX) in Abu Dhabi in February 2015, the company Insitu expressed its interest in the weaponized drones which was able to serve the spyware developed by the Hacking Team, the Remote Control SystemGalileo, for surveillance purpose. Insitu already produces the surveillance drones ScanEagle and RQ-21A “Blackjack”, it is likely the company is thinking to develop a new weaponized drone. Despite the content of the email is explicit, there is no specific information in other emails on the possible buyer for the weaponized drones. In one of the leaked emails, the co-founder Marco Valleri provided detailed information ongoing projects including roadmaps for the development activities. Among the projects, there is the “Tactical Network Injector” (TNI), a hardware device designed to inject malware into Wi-Fi networks. A drone equipped with a Tactical Network Injector could act as a bogus access point used by hackers to launch man-in-the-middle (MITM) attacks or to serve exploits. The principle is simple, if the target is using a public Wifi network, the drone forces it connecting to its access point in order to run MITM attacks and inject the malicious code designed by the Hacking Team. 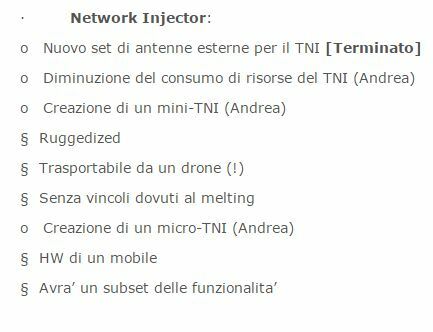 In the following image, I reported an excerpt of the email related to the Tactical Network Injector, the to-do list includes also the name of the resource assigned to the project, the Hacking Team employee Andrea Di Pasquale. Di Pasquale was in charge for the development of a ruggedized component that must be transportable by a drone (mandatory), and for the creation of a micro Tactical Network Injector usable by an unmanned aerial vehicle. The colleagues at TheHackerNews speculate on a possible interest of the US intelligence in the development of a weaponized drone. Just for your information, early 2014 researchers as Sensepoint security developed an application called Snoopy running on drones to steal users’ data, the software look for smartphone signal while it is searching for a WI-Fi network. The drone equipped with Snoopy software can trick mobile devices into thinking it’s a trusted access point, then the application can access data from the handset. According the creators, Snoopy was able to steal a huge quantity of information from victims, including user’s credentials, credit card numbers a location data. Researchers at Sensepoint successfully stolen Amazon, PayPal, and Yahoo credentials from random citizens in the streets of London. To protect user’s data it is strongly suggested to mobile device owners to turn off any automatic connection process, including WI-Fi network-finding feature. The post Internal emails reveal Hacking Team is working on a weaponized spying drone appeared first on Security Affairs.